I don't have a lot to say today, except WHEN IS WINTER GOING TO BE OVER? It started out as a pretty day, but by 10:00 a.m. it was cloudy and cold. It started raining by this afternoon. 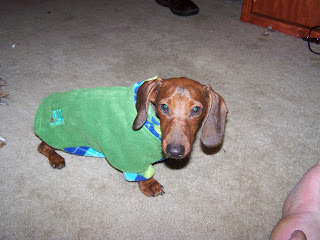 I really have issues about wearing my coat and going out in the rain to potty as you can see by my photo. I just don't like it at all. Moms found out about a great program for all us anipals. It is The Delta Society out of Washington. It a volunteer program to train to become a service and therapy dog to visit hospitals and nursing homes. I am posting the link to the website if your interested in checking it out. Moms is giving some serious consideration to going, but if Moms starts Nursing school in May, then her time is going to be limited. That's all I have for today. Love to all my anipal frineds around the world. This is my very first posting on my very own blog page. I am happy to be here and welcome everyone who comes to visit me and read about my days in Arkansas. A little about myself. I was born in Gravel Ridge, Arkansas on August 3, 2006. I live in Conway, Arkansas with my two siblings Butler Eugene and Treska Louise. 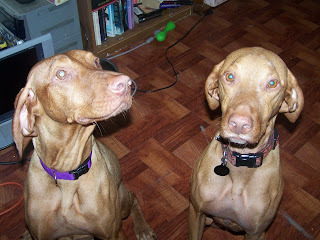 They are Vizslas (Hungarian Pointers). We live with my Moms. I sometimes think I am a Vizsla because I try my very best with my little dachshund legs to run and keep up with them when we go to the lake. Let us just say that I am a fast runner. Moms wants very much for me to get involved in dachshund racing, but sad to say that dachshund races are not something that Moms has been able to find around the state of Arkansas for me to do. Moms decided that she wanted a place for me to talk about pet issues in Arkansas and just share my days with you. I am happy to announce that the Arkansas Legislature passed a law that changed animal cruelty offenses from a misdemeanor to a felony. I am so happy that my state is beginning to catch up with the times. It is about time that people began to realize that cruelty to animals should not be tolerated. Considering everything that is going on in the world, I am so happy that this was the above the fold front page big bold letters headline. Conway is the Faulkner County seat. That means the courthouse is here. If Moms is available, she is going to go and sit in on the proceedings and find out if this man is found guilty and what his sentence will be if any.